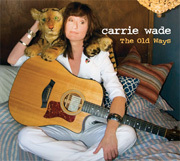 Carrie Wade is a seriously great songwriter. There’s a whole lot of people writing songs these days, and it’s always evident which ones have the gift, the spark, and which don’t. Carrie Wade has that spark. And that natural talent combined with years of musical and life experience has resulted in a songwriter who embraces the full gamut of life in her work, and always gracefully and uncontrived. This is genuine. In songs like her title tune “The Old Ways” and “In A World That Goes Wrong,” she fuses a prodigious gift for tunefulness with poetic lyrics of unforeseen candor. She’s a gifted melodist, and her archly angular yet irrepressible tunes bring to mind Neil Young and early Joni Mitchell, as in the title song, simultaneously sophisticated and simple, and exceedingly inviting. Her lyrics strike that crucial balance between the colloquial and the poetic, and her soulful vocals are reminiscent both of the aching purity of Emmylou Harris and the wounded bravado of Chrissie Hynde. She’s a savvy artist in a multitude of ways, not the least of which is her choice of co-producers, New Zealand’s Peter Kearns and America’s own Marty Rifkin (legendary for his pedal steel playing with Springsteen and others). Both are hands-on multi-instrumentalists who draw from their own seemingly limitless instrumental palettes, but always in service of the songs; the production throughout is gently inventive and dimensionally evocative, surrounding yet never overwhelming these heart songs with a happy and rhythmic luster. Carrie’s message throughout is a positive one, that although our lives are often painful, such sorrow and struggle can deepen the artistic well and strengthen the soul. “In A World That Goes Wrong,” which is beautifully colored by Rifkin’s haunting pedal-steel passages and Kevan’s Torfeh’s mournful cello, we get a declaration of triumph, of transcending everything modern times presents to derail an artist. That sense of triumph shines throughout The Old Ways, and it’s a welcome sound in these trying times. Keeping hope alive is perhaps the greatest challenge we daily face in these chaotic days, and music like this goes a long way in helping us all remain hopeful. 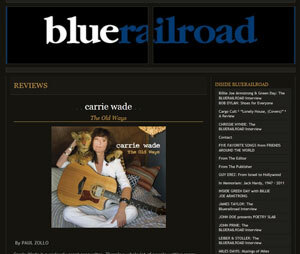 This entry was posted in Reviews and tagged acoustic, blue railroad, carrie wade, folk, music, nashville, paul zollo. Bookmark the permalink.